Title: 10/21/1997 - A centralized repository for the electronic collection and dissemination of MSDSs. We have received your inquiry regarding the proposal submitted to OSHA by your constituent, Mr. Ernest Isenberg. 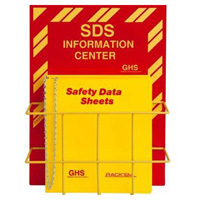 This proposal had to do with the organization of a centralized repository for the electronic collection and dissemination of Material Safety Data Sheets (MSDSs). As conveyed to Mr. Isenberg in a letter dated August 1, 1997, (attached) OSHA has no objections to the use of electronic means for the transmittal of MSDSs. The available technologies (Internet, fax, e-mail, etc.) meet the requirement of "immediate access" to hazard information and both employers and manufacturers could benefit from the usage of these technologies. Mr. Isenberg's proposal, however, suggests the organization of an OSHA-mandated national repository for MSDSs. As the Hazard Communication Standard is a performance-oriented standard, OSHA tries to maintain flexibility for the regulated community in meeting the requirements of the standard. Mandating electronic dissemination of MSDSs could place an added burden on both manufacturers and downstream users, especially small businesses, which would be required to obtain computer and telecommunication linkups to obtain access to hazard information. In May of 1995, the Clinton Administration, as part of its National Performance Review, issued a report containing a number of recommendations, one of which was the establishment of a National Advisory Committee on Occupational Safety and Health (NACOSH) workgroup on hazard communication and the "right-to-know." In a continuing effort to improve hazard communication, and in line with recommendations contained in the 1995 President's Report, OSHA asked NACOSH in September, 1995, to convene an expanded workgroup to identify ways to improve chemical hazard communication and the "right-to-know" in the workplace. The workgroup determined that even though the organization of a national repository is technologically feasible, "the development of a national repository is [not] a viable suggestion for OSHA at this point, and [the workgroup] does not recommend that the Agency pursue such an activity." Enclosed is a copy of the NACOSH report. The issue of electronic access is discussed on pages 58 through 61 and 86 through 90. Additionally, several service companies are engaged in the collection and electronic dissemination of MSDSs. OSHA has informed Mr. Isenberg that we would not restrict the National Association of Wholesalers or any other trade group from using one of these companies or from setting up a separate service for their members. We have provided Mr. Isenberg, by phone, with the names and telephone numbers of organizations we are aware of which are engaged in the electronic transmittal of MSDSs. Additionally, we have provided to Mr. Isenberg in writing OSHA's policy for compliance when using these technologies. If further information is required, or if you would like to discuss this matter, please don't hesitate to contact us.